She is powered with twin 480 HP Cummins Diesel Engines. 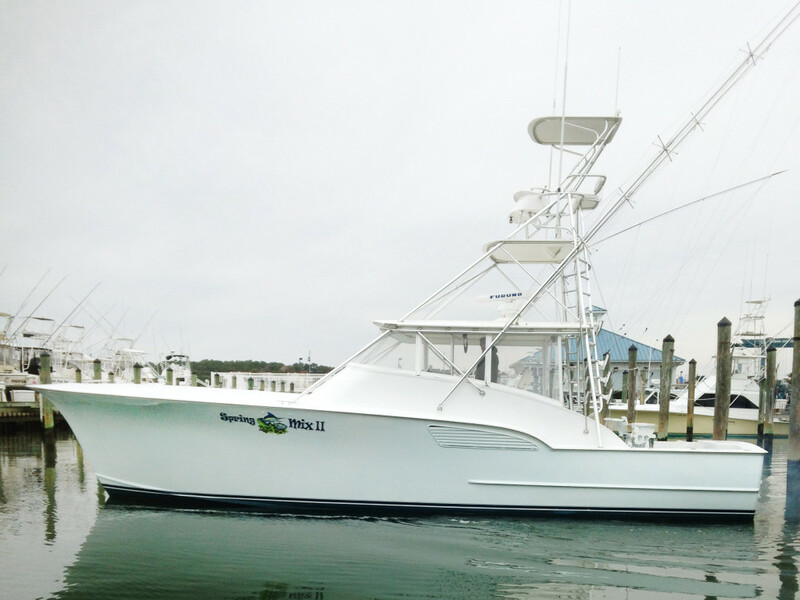 This well equipped 43 ft Sport fishing Boat has a very wide beam (15’8”) so you will have more than enough room for your fishing group of six for a day or overnight trip leaving out of The White Marlin Capital of the World Ocean City Maryland May--November. Captain Steve Selander and Captain Chris Watkowski have over 40 years of combined experience fishing the East Coast particularly out of Ocean City Maryland. The electronics and the fishing equipment on the boat are state of the art and kept in very good working condition. You will not find a cleaner or better maintained charter boat in the area. We fish from 35 to 100 miles off shore in search of Shark, Tuna, Mahi, Wahoo and of course Marlin. Captain Steve Selander and Captain Chris Watkowski are Ocean City Offshore Fishing Professionals,and they know how to put you on the fish. The Spring Mix II is conveniently located in the Ocean City Fishing Center Slip B-12.